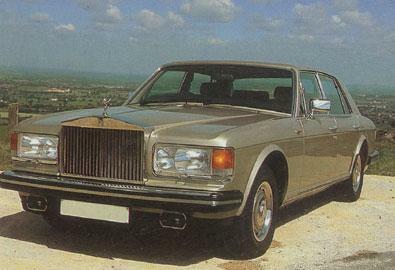 The legendary rolls-royce company is not in the habit of changing its models every season, so the arrival of the new silver spirit in 1980 (to succeed the silver shadow, launched in 1966) was quite an event. Its misty, ethereal name was a rolls-royce custom that barkened back to the silver ghost of 1907. Straight-cut elegance coming from a company so strongly steeped in tradition, it was inevitable that the radiator grille would retain the greek temple shape of its predecessors. The bodywork reflected the models simple elegance. Its styling, by the austrian designer fritz feller, was entirely new, and perhaps a touch heavy. The gently curved side windows and built-in headlights recalled pininfarinas r-r camargue coupe. progressive evolution mechanically, the silver spirit was akin to the preceding model, with unitary bodychassis construction and a v8 power unit. Over the years, the silver spirit has been progressively developed, so that now electronic fuel injection, antilock braking and an exhaust catalyst.are included in the cars regular specifications. Though the bodywork of the silver spirit was completely new, mechanically it was directly descended from the silver shadow.